It’s okay to cover an existing layer of shingles with a new one – Just because many building codes say it’s acceptable doesn’t mean you should do it. Underneath shingles is a layer of wood sheathing that can rot due to leaks, inadequate attic ventilation, or age. Before doing anything, strip away the old shingles. 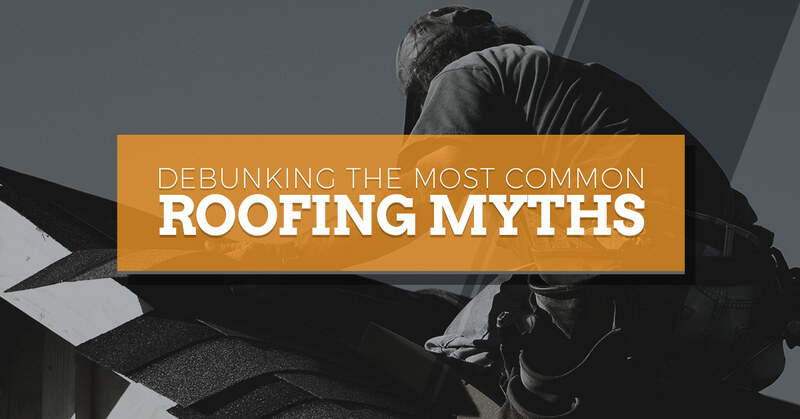 All asphalt shingles are the same – This is one of the biggest misconceptions in the book. In fact, today’s asphalt shingles are better than ever. From algae-resistant shingles to shingles that are manufactured to look like wood shakes or slate tiles, you are certain to find a type that works for you. Flashing should only be replaced when a new roof is installed – Flashing is the metal material made to divert water away from pipes, vents, and other openings in the roof. Flashing can lay in place for years and protect even longer than other components of the roof. On the other hand, flashing can fail in a matter of months and ruin an entire roofing installation. Keep in mind that flashing should be checked about twice a year. You will want to look for sealant or dried caulking, cracked or broken pieces, and damaged shingles in contact with the flashing. Attic insulation saves energy and helps roof performance – Homeowners are often surprised when they learn that adding more than the required insulation can block ventilations openings and might even trap moisture. This can warp and rot sheathing from the attic’s interior, which is basically an invitation for mold. Gutters are separate from the roof – The purpose of a gutter is to prevent water from dripping down exterior walls and move it from the foundation.If you don’t already, be sure to clean gutters of debris, sediment, and leaves on a regular basis. You don’t want to have to deal with clogged and sagging gutters, which may cause leaks behind exterior walls and contribute to ice-damming. At Sands Roofing and Construction, we make it easy for homeowners. For one, we are licensed, bonded, and insured to perform the highest quality of work that you deserve. Our staff also has a great relationship with all major insurers. Secondly, we’ve been a staple of Lexington for years so we call the area home just like you do. Lastly, we have licensed insurance adjusters on staff in order to effectively handle your claim. When it comes to residential roofing, no other team of roofing contractors offers the same high-quality work at such an affordable price. Get started today by contacting us for roof repair service or installation.